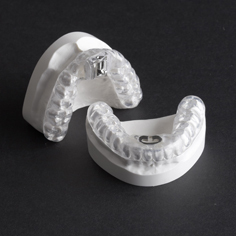 There is a new solution available to those who snore or have sleep apnea – The Thornton Adjustable Positioner® (TAP®), an oral appliance similar to an athletic mouth guard that is worn while sleeping. Developed with advanced technology, the TAP® reduces sleep apnea and associated health risks without the need for surgery, medications, or other more cumbersome therapy. The TAP® is a medical device that treats sleep disordered breathing. It alleviates snoring and sleep apnea by holding the mandible forward during sleep to prevent the tongue and soft tissue of the throat from collapsing into the airway. The TAP® is based on the same principle as cardiopulmonary resuscitation (CPR). The airway must be open to allow air to pass through the throat. 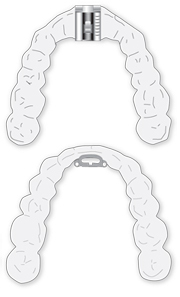 The TAP® device consists of an Upper Tray that fits over the upper teeth and a Lower Tray that fits over the lower teeth. A hook mechanism attached to the Upper Tray fits into a Socket attached to the Lower Tray and positions the lower jaw forward, preventing the soft tissue of the throat from collapsing and obstructing the airway. The Adjustment Key of the TAP® permits the patient to adjust the protrusion of the lower jaw to the most effective and comfortable position.